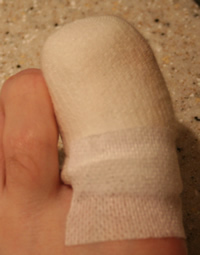 Permanent removal of one or both sides of a painful ingrowing nail or total removal of the nail. A local anaesthetic is injected near the toenail to numb the toe so that the procedure is painless. If you have ever had an allergic or adverse reaction to an anaesthetic before it is extremely important to mention this. Once the area is numb, the troublesome section of the nail is removed. To prevent the nail from growing again a strong chemical is then applied to the nail matrix to destroy the nail producing cells. The toe is then dressed. Permanent removal of the medial side (inside) of the left big toenail. Ingrowing toenail a few months after nail surgery. The area is healed. Very occasionally re-growth of the toenail will occur. Should this happen and the toenail is still a problem the procedure will be redone at no expense.